The studio is situated in the 3rd floor of an old fabric building and has a size of 70 m2 divided in 4 rooms, giving the opportunity to work simultaneously on different projects as well as fulfilling a good acoustic separation of instruments for recording production. Big windows and a balcony on the south side will guarantee good mood and inspiration. The concept is to get the best out of the analog and digital world and take benefit of it's respective advantages without compromisses. The analog path from the microphone and preamps to the AD converters are some of the finest available inclusive: Neumann, Telefunken, Universal Audio, Focusrite, Tegeler Audio. Protools for editing and mixing, Universal audio plugins, Wavelab for mastering. Exhaustive selection of analog and digital work-station for music production. Nadanadi Studio is a creative and open space, any kind of collaboration can be considered. 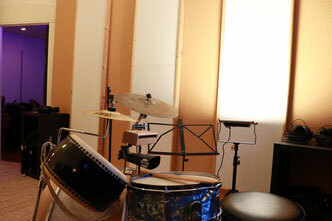 Rehearsal for musicians and bands, renting the whole studio for recording. don't hesitate to talk to us if you have any ideas.